Hello to all you Loafers! This is my first blog entry and I thought I'd start out with my second most recent endeavor (I made sourdough bagels but didn't take any pictures!). I'd like to give a little preempt by saying that I am only slightly Jewish by blood and an Atheist at heart. That being said, if you have any Jewish blood or get Anthropological hard-ons, purchase Maggie Glezer's A Blessing of Bread NOW! This book is filled to the brim with traditional but well tested/formulated recipes and all the stories, traditions and techniques that go with them. As soon as I opened this book I would be baking a lot from it and the real challenge was to decide which recipe to try first, as you can see I choose one the the numerous Challah recipes and being a sourdough sucker I landed her My Sourdough Challah recipe. This recipe is a winner! 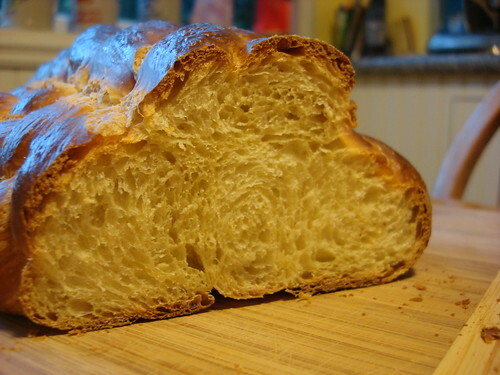 The one thing that a wild culture really adds to this recipe is the extra oven spring achieved that allows for this nice tears along the braids, it's one of the few loaves that have made my jaw drop. 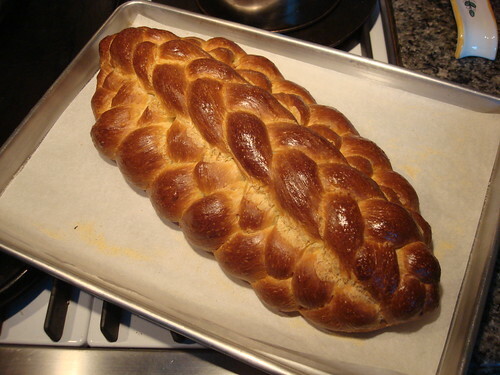 For the sake of full disclosure, I've been professionally trained as a baker and have made Challah before but those recipes were either too high hydration or fermented to quickly with too little oven spring in order to achieve those distinct braids. I did make 1.5 adjustments to the recipe and they were to replace some of the whole eggs called for with yolks and half of the oil with olive oil. I did this for color, added richness and to avoid that eggy flavor that comes with the whites (just not my cup o' joe). The results were wonderfully yellow tinted crumb that was soft and just begged for a little of that naughty butter as well as making incredible toast. The flavor was a perfect blend of rich and savory, using a natural levain really didn't add a tang so much as it amped up the flavor profile of the wheat to balance the eggs, sugar and oil. From beginning to end this dough was a pleasure to work with and I encourage you all to buy this book if you haven't! I'm glad you mentioned the prior professional baking experience, Brot Backer. It would be daunting for this amateur to do so well. Even so, I'm impressed by your braiding skils. That's a gorgeous loaf! Professionally trained and professional skill don't always go hand in hand but this time it seemed to work out, haha! 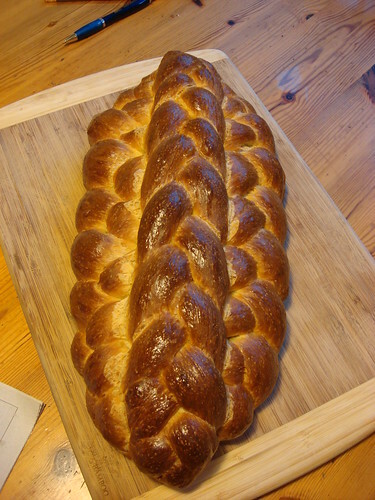 The shape is two large 3-strands with a small 3-strand down the middle, I've always thought that is has the highest ease:wow-factor ratio of the braided loaves. 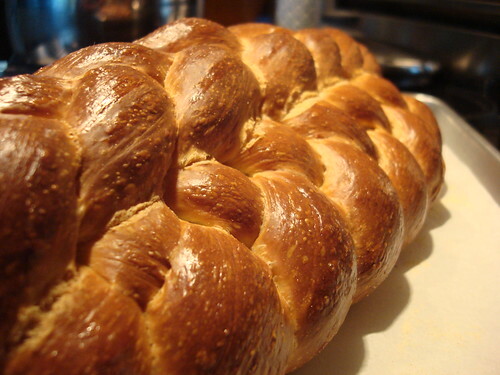 braids and crumb on your challah! I'm not a professional baker but have had some wonderful results with MG sourdough challah formula...it's a keeper! I am sure to revisit this one after I run through I few more of her recipes, it is just such a fantastic book! I haven't spent so much time reading one bread book since The Bread Builders. This formula is one of my favorites. Your challah is a work of art. I started this blog in hope that I'll make more time to bake when I'm not working or going to school and from the positive feedback I'm thinking it might work! Now that's a real purdy bread! Nicely done. I hope it tastes as great as it looks. Oh my, that is beautiful. As someone who struggles with braiding (I have attempted 4, 5 and 6 strand loaves), I am encouraged to read that this was simply building 3 strand loaves together. I have been meaning to try this recipe for a while now. You may have just given me the push I needed. Ifthe idea of a sweet crumble topping appeals to you, check out this recipe. Thanks all! I baked my first miche today, I should have a new entry up about it soon. from Zeb who struggled with a high six braid today and failed utterly, so made a different shape altogether. Brot Backer's Recent Blog Entries.